The pilot reported that, while enroute, he noticed a loose camlock screw on the engine cowling and decided to land the airplane at the nearest airport. He added that, during the landing, he applied the brakes, but they had "minimal effect". As the airplane slowed "very slightly", he determined he could make the taxiway turn. But, he added that, "the left steering did not effect direction", the airplane exited the runway, and went over the runway embankment. The pilot reported that the brakes failed to slow the airplane to a complete stop, and the nose wheel failed to turn. A local mechanic inspected the brakes following the accident and found no anomalies. The airport manager reported that, marks on the runway showed the airplane touched down approximately 1000 to 1500 ft beyond the approach end of the runway. Additionally, there was approximately a 150 ft. long skid mark showing a skidding left turn before the airplane exited the runway. Pictures submitted by the Federal Aviation Administration inspector showed the skid marks turning left while exiting the end of the runway. The airport supplement states, runway 25 slopes downhill to west. 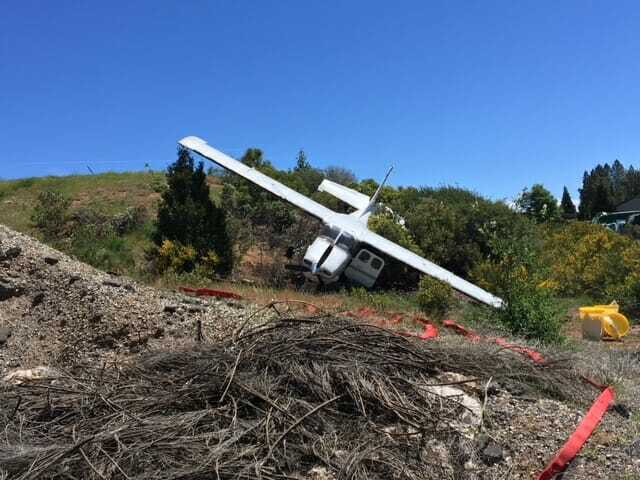 May 9, 2018 – Fire units responded for a reported “aircraft accident” at the Nevada County Airport. At scene, crews found a single prop aircraft that had skidded of the runway and came to a stop in brush at the west end of the runway. The two occupants were out of the aircraft and denied any injury. Due to leaking fuel, several absorbent pads were placed and environmental health notified. Crews remained at scene approximately 2 1/2 hours for a crane to arrive and remove the aircraft. Battalion 1, E-5482 and E-86 were assisted by CAL FIRE, Sierra Nevada Ambulance and Nevada County Environmental Health Department. All units were released at 3:00 pm.